The bleeding edge of the plate movement has always been the Indo-Australia Plate, which is being pushed under the Himalayas at the India end, and hammered on the eastern end near New Zealand and Fiji. The eastern end has been lifting recently, since the 7 of 10 scenarios started toward the end of December, 2010. The Indo-Australian Plate has also been tilting, such that the side curving around Sumatra and Java is rising and the opposite side, where Pakistan has lost elevation along the Indus River, is dropping. 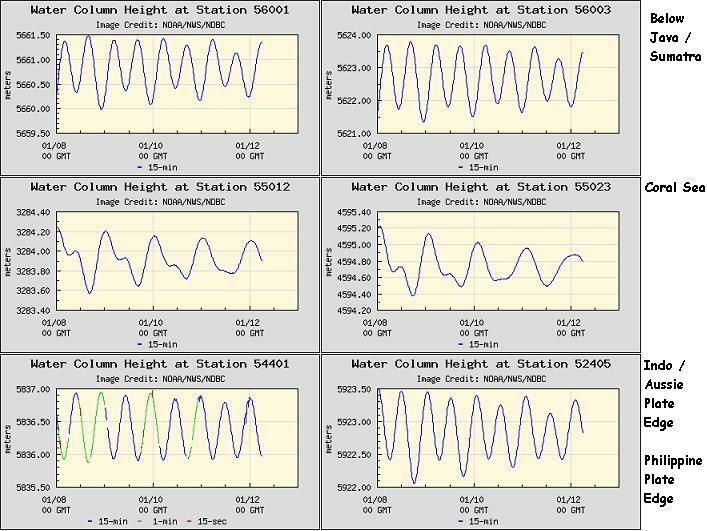 The buoys clearly show this rising and tipping. 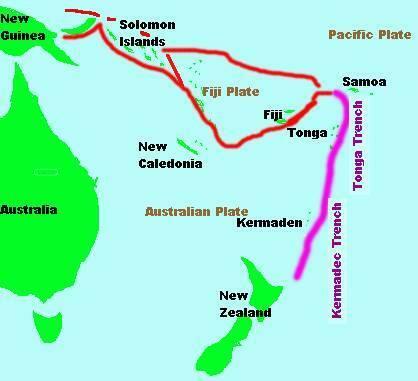 All of this affects the Fiji Islands which lie on a small platelet nudged into a notch in the eastern edge of the Indo-Australian Plate What kind of pressure must that small platelet be under, with the great Pacific Plate pushing against it from the backside, as it crushes into the rising notch? The Zetas explain. Continuous rain has led to flooding in most parts of the Western and Eastern Division. The heavy downpour continues in Rakiraki, Tavua, Ba, Lautoka, Korovou and Naqali. Members of the public are requested not to cross the flooded rivers and bridges and to adhere to the warnings given by the authorities. Traffic between Suva and Rakiraki along the Kings Road was at a standstill as floodwaters rose as high as four metres. Corporal Navosavakadua said three bridges and the road to Nasautoka, Nabouva and Wailotua No 2 were submerged in water measuring four metres. ZetaTalk Explanation 1/15/2011 The islands at the plate borders in this region do not do well during the plate adjustments to come. The primary devastation will come during the hour of the pole shift, but the devastation has started during the 7 of 10 adjustments. Samoa rides on the Pacific Plate, which is pushing under eastern edge of the Indo-Austalian Plate, and as this process continues and accelerates, approaching the pole shift, will virtually disappear. The Solomon Islands do not fare much better, for the same reasons. Tonga and New Caledonia ride high. 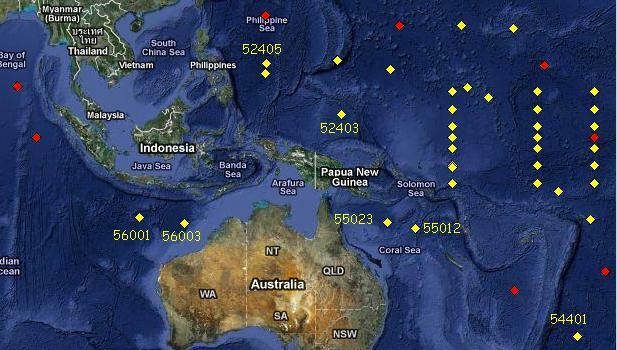 The little Fiji Plate, as the recent sinking indicates, will be a loser, pushed down into the notch as the Pacific Plate presses ever westward. We presented this concept in Issue 219 of this newsletter on December 31, 2010. Another example has arisen and been cleverly captured by Lothar, a dedicated member of the Pole Shift ning. On January 13, 2011 at 16:16 UTC there was a 7.3 earthquake on the eastern border of the Indo-Australian Plate, at the Loyalty Islands. And indeed, the highly sensitive Coral Sea floor, which is a thin point on the crust per the Zetas, reflected this quake. The floor of the Coral Sea has been rising and falling, because when the Indo-Australian Plate tilts its eastern edge up it is heavy, and until magma fills in underneath, the plate tends to bend at this weak point. Thus, at those times, the Coral Sea floor approaches the surface, the water less deep. But likewise when the plate adjusts with a bend elsewhere, between Australia and India, for instance, the Coral Sea can straighten out. ZetaTalk Explanation 12/31/2010: Queensland flooding along rivers that normally drain into the Coral and Tasman Seas is excessive and breaking all records, and certainly not accounted for by any trivial rain it has received over the past few days. But the Tasman Sea is reflecting only a scant increase in water level depth, where the Coral Sea is dramatic. What could cause the plate to flatten, as the eastern edge tilts higher? Certainly, the weight being lifted has only increased. What has occurred is a deeper adjustment in the magma flow under the plate, where the Coral Sea bulge dealt with a temporary situation. The magma flow is now sweeping under this tilted plate, thus relieving the weight of the eastern edge of the plate so the Coral Sea can relax. If the Coral Sea floor is dropping again, we can expect the flooding in Australia to ease, as the waters will no longer be running up river in Queensland. The Zetas predict the floods in Queensland will ease as quickly as they arrived. ZetaTalk Prediction 1/8/2011: The establishment is desperate to prevent awareness of the presence of Planet X in the inner solar system, and has agreed among themselves that blaming rain and storm surge for the sinking of land in Indonesia would be the first volley against the ZetaTalk message. Thus, in Asia, any type of flooding, whether there has been rain or not, is blamed on rain in the media. Unexpected was the flooding in Queensland, as this had not been mentioned by ourselves. Australia was not included in the news blackout issued to cover our 7 of 10 predictions, and thus news of this flooding hit the world. We have explained that the water wash backing up rivers along the eastern coast of Queensland is due to the tilting of the Indo-Australian Plate, but as this phenomena had not been expected, the establishment was taken by surprise. What does this mean? Is this a permanent state of affairs? That would hardly be the case, as water finds its level and the water heaped around the eastern edge of the Indo-Australian Plate is flowing in many directions to this end. The rivers will soon be flowing to the sea, unimpeded, and the flood waters draining as rapidly as they arrived. In a moment of honesty, an Australian mayor of one of the coastline towns gravely affected in recent days indicated to the press that they had had no rain! Flooded Australia City "like War Zone,"
The floods across the state of Queensland have killed at least 19 people, 12 of whom died in the Toowoomba area inland, and 61 were missing. Toowoomba and the Lockyer Valley region, west of state capital Brisbane, were devastated by tsunami-like flash flooding. Large parts of Brisbane have become muddy lakes, with an entire waterfront cafe among the debris washing down the Brisbane River, a torrent that has flooded 12,000 homes in the city of 2 million and left 118,000 buildings without power. The flooding, which started before Christmas, continued in other areas of Queensland, with the 6,000 residents of Goondiwindi southwest of Brisbane facing a record flood. "This is a very eerie flood for us because we've had no rain," said Goondiwindi Mayor Graeme Scheu. If the sinking of the plate tongue holding Indonesia was supposed to take 2-3 weeks and presumably commenced on December 23, 2010 when southern Java experienced flooding, where are we now that 3 weeks has passed? The Zetas stated that "The start will be sudden, almost without warning, but the progress not swift as in the pole shift hour. It will be a steady sinking, in short bursts, over a 2-3 week period." When did this 3 week period commence? We know that the Christmas Hammer started on December 20, 2010 with the live seismographs going black and large quakes on the Bonin Islands south of Japan along the Philippine Plate edge and in Vanuatu along the eastern edge of the Indo-Australian Plate. We know that Pakistan has been sinking, the Indo-Australian Plate tilting sideways, since July, 2010 though not admitted to have lost elevation there for several months, not until December in fact. We know that the sequence of events for the 7 of 10 puts the tilting of this plate first, just ahead of the sinking of the plate tongue holding Indonesia - "a tipping Indo-Australia Plate with Indonesia sinking". We know that Brisbane began getting flooding from the raised eastern edge of the Indo-Australian Plate by December 22, 2010. We know that southern Java began experiencing flooding on December 23, northern Sumatra on December 27, The Philippines on December 29, and Malaysia on December 31. Thereafter reports were numerous, included Thailand and Borneo and Bali, and referred to flooding "from the sea" and "renewed" flooding. ZetaTalk Explanation 1/15/2011: The rapid drop in elevation expected for the plate tongue holding Indonesia, the final phase, has not yet arrived, though it will be soon. Where we are precise and remarkably accurate in our predictions, we are not perfect. For the tongue to drop, the Indo-Australian Plate must tilt sufficiently, and as anyone watching this and other plates in the vicinity undulate, this is not a simple process. It's an iterative process. The curve under Sumatra and Java rises, causing the Coral Sea floor to rise, rushing water onto Queensland. Then magma fills in under the eastern end of the Indo-Australian Plate so the Coral Sea bend can relax, allowing water to rush back and halting, temporarily, the tipping process. Then it all starts over again. Meanwhile, the four Pacific plates are compressing, a process that is invisible to man who does not have his seismograph monitors deep under the ocean along the plate borders. What is clear is that the top of S America is pressing to roll, causing S America to crack in the middle and southern Brazil flooding to occur, that the Bonin Islands south of Japan are reflecting a tilting Philippine Plate, and that Fiji is sinking. The process is steady, and inevitable, and it did start prior to the end of 2010. The Coral Seabed may be undulating faster than a hula dancer's hips, but meanwhile, sinking continues. As might be expected, the southern coastline of Java and Bali, at the southern edge of the tongue, could be the first to report renewed flooding. And they are! We are no longer pretending that it is flood waters swelling rivers. It is from the sea. On the East Nusa Tenggara island of Flores, high waves that reached as far as 100 meters inland swept away at least 18 houses in Sikka district's Nangahale village. Residents have also been warned to temporarily suspend their fishing activities because of the high waves. The early morning storm destroyed 11 houses, built by the military in 2006 to house refugees from East Timor. Few parts of the globe have more earthquakes than Japan, which seem bombarded almost daily. The Japanese have learned to use earthquake clouds as a predictor, and a recent example shows how accurate such observations can be. 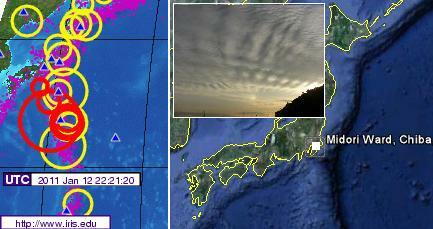 On January 11, 2011 at 4:21 pm earthquake clouds above Chiba City were observed. This is the spot where three plates meet - the Pacific, the Eurasian, and the N American Plate. The observation lwas looking out over the water, down toward the Bonin Islands, one of the spots hammered during the Christmas Hammer on December 22, 2010. Did the quake clouds indicate another hammer was going to descend on the Bonin Islands region? Yes!